The jewellery box shown opposite has been manufactured in a school workshop. Before being manufacture it was designed and drawn using drawing equipment including a T-square and a 60/30 degree set square. The stages involved in constructing the ‘isometric drawing are shown below. 2. 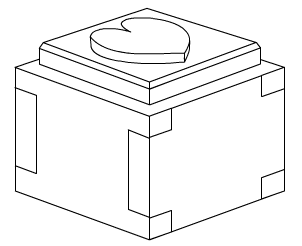 Draw guidelines to help start constructing the left and right sides of the jewellery box. Remember to use a 30 degree set square for the 'angled' lines. 3. The top of the jewellery box can be drawn quite easily by using the set square to draw one edge of the top and then ‘flipping’ it over to draw the other. 4. The basic lid shape is drawn using the same techniques even though the lid is quite thin. 5. 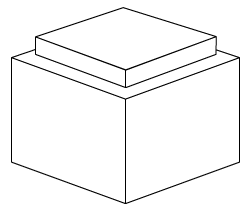 The chamfer is added by first drawing a small isometric square, floating above the rest of the basic lid. 6. 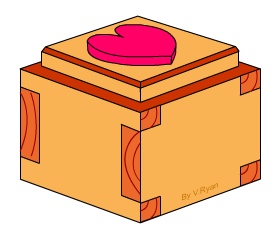 Add short angles lines from the basic lid to the left and right hand corners of the isometric square. This produces an effective chamfer. 7. Add a shape to the top of the lid and also joint work. The joints shown are simple finger joints. These could be changed to dovetail joints although this type of joint is much more difficult to draw.